Shakira and Footballer Gerard Pique rumored to split? Is is true? Home Article Shakira and Footballer Gerard Pique rumored to split? Know the details about their relationship. Shakira and Footballer Gerard Pique rumored to split? Know the details about their relationship. The Colombian singer Shakira has won the heart and soul of many fans with her songs like Underneath Your Clothes, Hips Don't Lie, Whenever and many other hits. Besides her professional career, her personal life is equally fascinating. She is a mother of two adorable kids. Many people including media have some speculations regarding her breakup with longtime boyfriend Gerard Pique. Well, know all the details over here. Shakira, 40, and Gerard began dating since the year 2011. They met each other in the spring of 2010 while shooting for the video of the song 'Waka Waka', the official song of the 2010 FIFA World Cup. Since then the couple has been inseparable. She even went on many games in which Piqué played to support him. 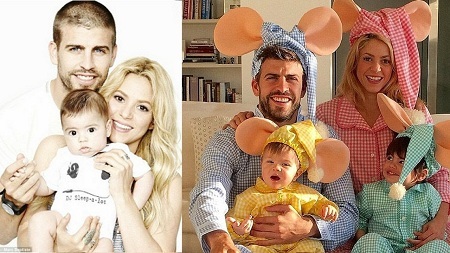 The couple welcomed their first baby boy, Milan Pique Mebarak back on 22 January 2013 and their second son, Sasha Pique on 29 January 2015. Shakira previously dated Argentine lawyer Antonio de la Rua in 2010. The former duo maintained their relationship until August 2010 as she stated: "a mutual decision to take time apart from our romantic relationship". Barcelona defender Gerard attended Shakira's current rehearsal for her European tour on 10th October and posted a video on his Instagram. The dad-of-two signalized their fans and perhaps their haters to maintain silence before turning the camera to Shakira. As the split rumors are spreading like a wildfire since past few weeks, Shakira's publicist confirmed to HELLO! and HOLA! the two sister magazine that the couple is still together and mentioned: "Everything is the same". The publicist also confirmed that the act was just to disturb the healthy life of the duo. The act was basically committed to harm them. In addition, the Columbian singer spoke in an interview back in the month of September in HOLA! that she is living a wonderful life with FC Barcelona star since 2010 balancing their family life and busy career. "We try to do the best we can. There's a lot of love; that's the foundation of any family. You have to take care of it and dedicate time. Family is the most important thing for me; the rest is secondary." Well, we just expect everything to be awesome between the couple. We are eager to see the couple get married. Born on 2 February 1977 in Barranquilla, Atlantico, Columbia. The only child of her father William Mebarak Chadid and mother Nidia Ripoll Torrado. Her grandparents were immigrants from New York City. Her name is an Arabic word which means "grateful". Was just four years of age when she developed a desire to be a performer. Performed in several events when she was 10 and 13.